In the earlier post on understanding BOB protection (here) the focus was on 4 man (even) front defenses. Now the focus will shift to 3 man (odd) front defenses. As previously discussed the offensive line in a BOB protection vs. an even front must declare a "Mike" and account for the 4 down linemen and the "Mike" in protection. Similarly, versus an odd front defense the offensive line must account for the 3 down linemen and 2 linebackers. Which 2 LBs the offensive line is responsible for depends on the offensive philosophy. 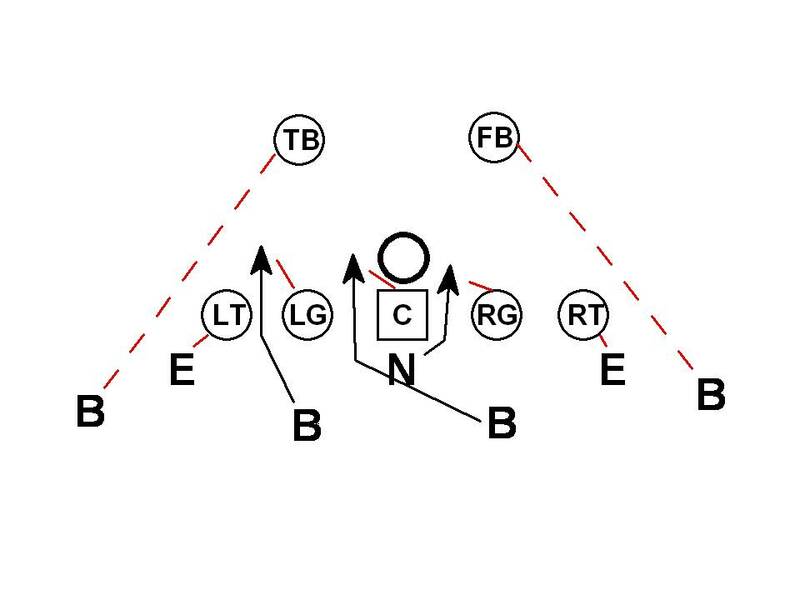 The 2 linebackers can be the 2 inside, 1 inside & 1 outside, or both outside. In this example the offensive line is responsible for the two inside linebackers. 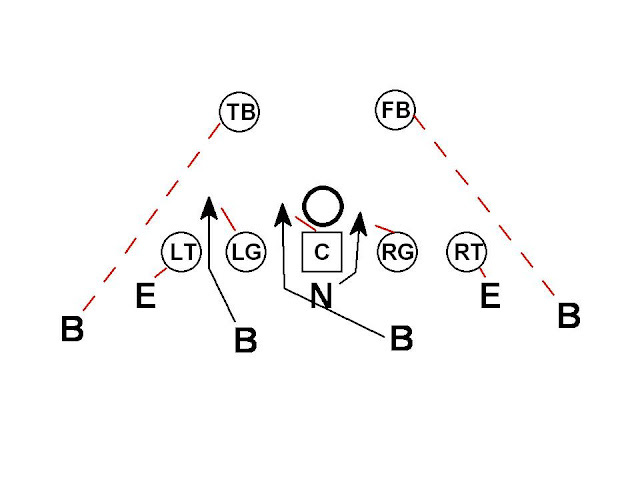 This creates a 3 for 3 scenario for the Guards and Center vs. ILBs and the Nose. The backs are responsible for the outside linebackers. Here the LG, C, and RG have the two ILBs and the Nose. If the offense went to a one back formation the single back would have a dual read on both outside linebackers. 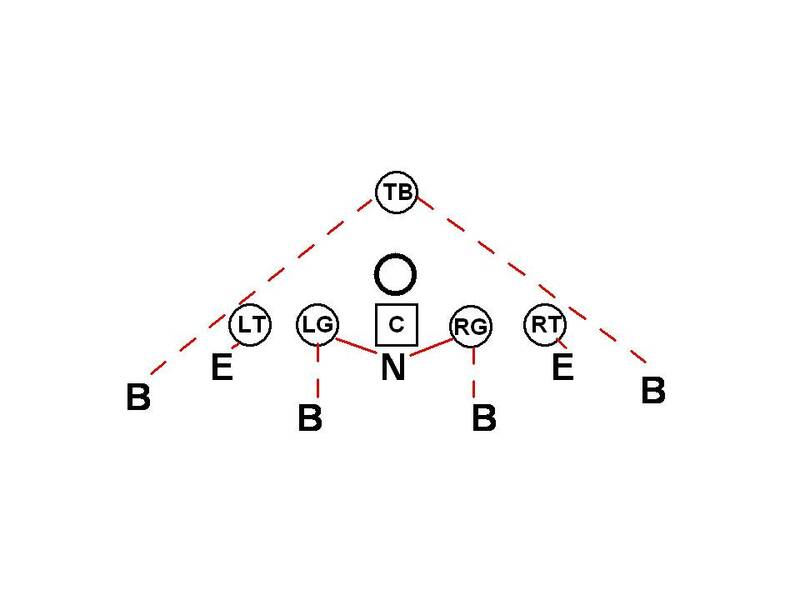 The second BOB scheme the offense can use vs. the 3-4 is to have the offensive line responsible for 1 inside linebacker and 1 outside linebacker. In this scenario the offense has a 4 for 4 match up vs. the defense (LT, LG, C & RT for Left DE, NOSE, LOLB, & LILB). This protection scheme shares many similarities to 1/2 slide protection. The RT is manned up and the 2 backs have the RILB and ROLB. 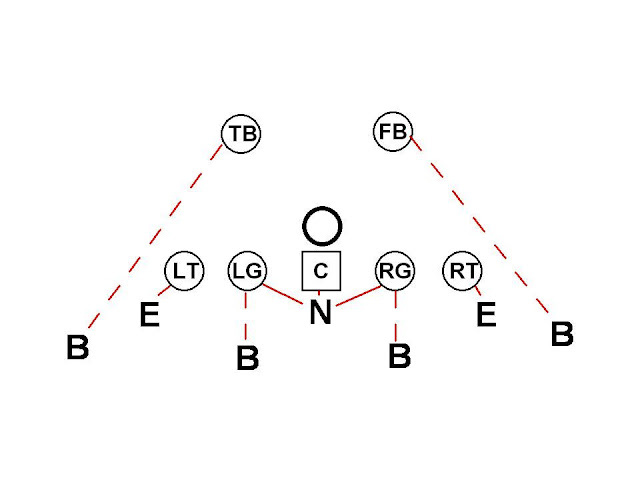 If the formation is single back the one back would have a dual read on the ILB to Outside linebacker. The third protection option for BOB teams is to assign the offensive line both outside linebackers. 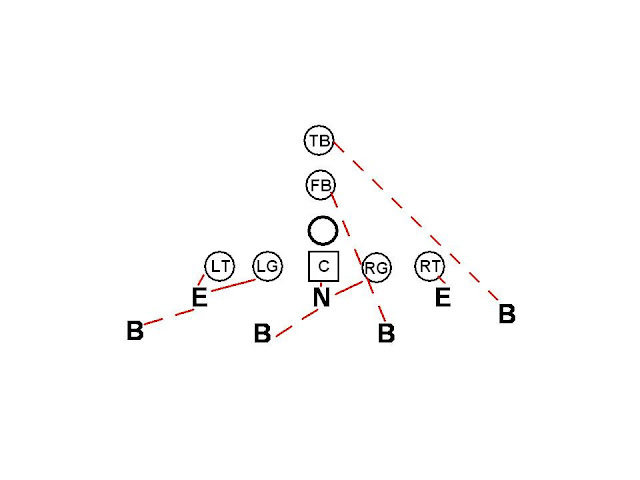 The OGs and OTs are working together for the DEs and OLBs, the Center has the Nose and the backs are on the ILBs. If it were a single back formation the one back would have a dual read on the two inside linebackers. For more information on this version of BOB be sure to check out posts on Brophy's Blog here and here. 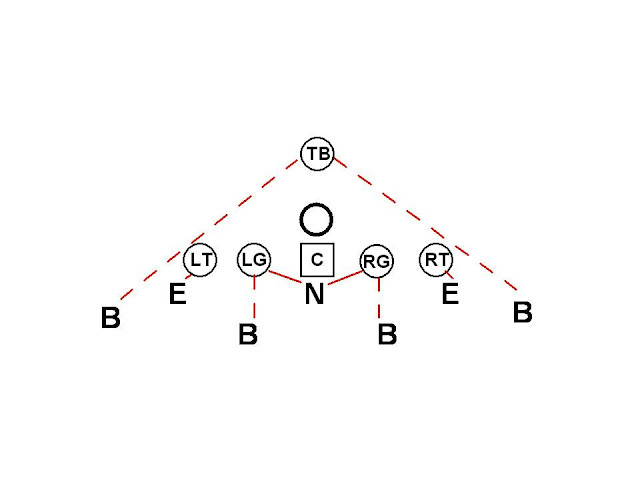 The first step to attacking BOB with the 3-4 is determining which 2 linebackers the OL are responsible for and which ones the backs are responsible for. The up coming post will focus on each of the three versions of BOB and strategies for attacking them. 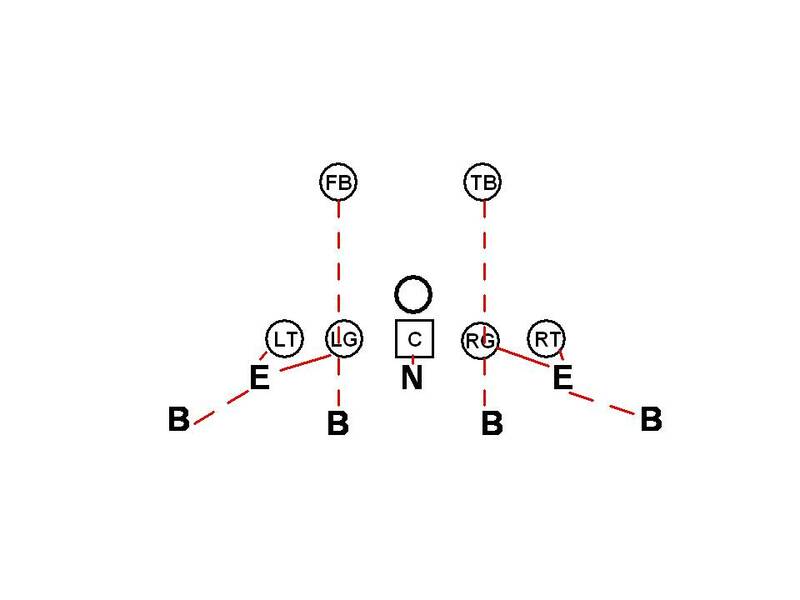 Another 3-4 scheme is to have a guard and a back dual read the inside LB together to their side. Both read the ILB and if he does not blitz, the back can release without checking the OLB because the guard will now kick-slide to pick up the OLB if he blitzes. If the ILB blitzes, the back must check the OLB before releasing. With two backs, this ensures you get you maximize the probability of getting a back(s) out while still being able to block 7. 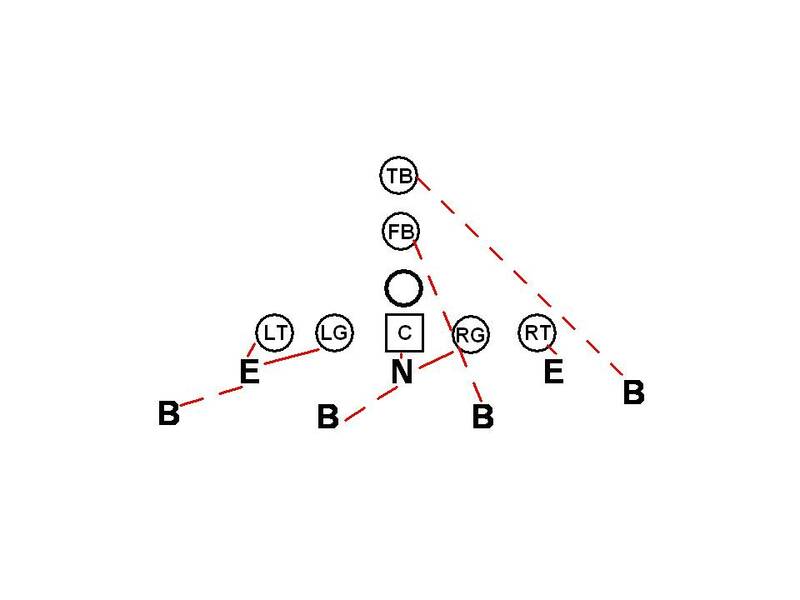 This scheme is vulnerable to (a) zone blitz, and (b) stunts that involving an ILB. Walking a LB up and engaging the OG and then dropping while blitzing the OLB will force the back to block the OLB (he's covered and you beat him for a sack). Twists that bring a LB over to the other side or cross the ILB and OLB are problematic and require lots of reps to handle.